2 Sharing Time! Let’s take 1 minute each to share something fun that you did last week. Remember to reverently listen to others as they share. You can ask questions when they are done. Please hand out a piece of paper to each person in the room. 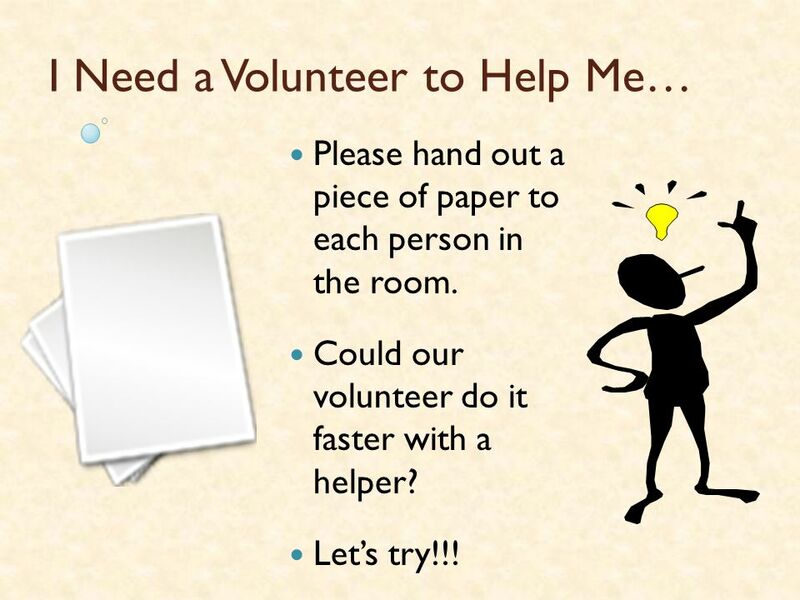 Could our volunteer do it faster with a helper? Let’s try!!! Let’s divide the class into 2 equal groups. Each volunteer is responsible for 1 of the groups. 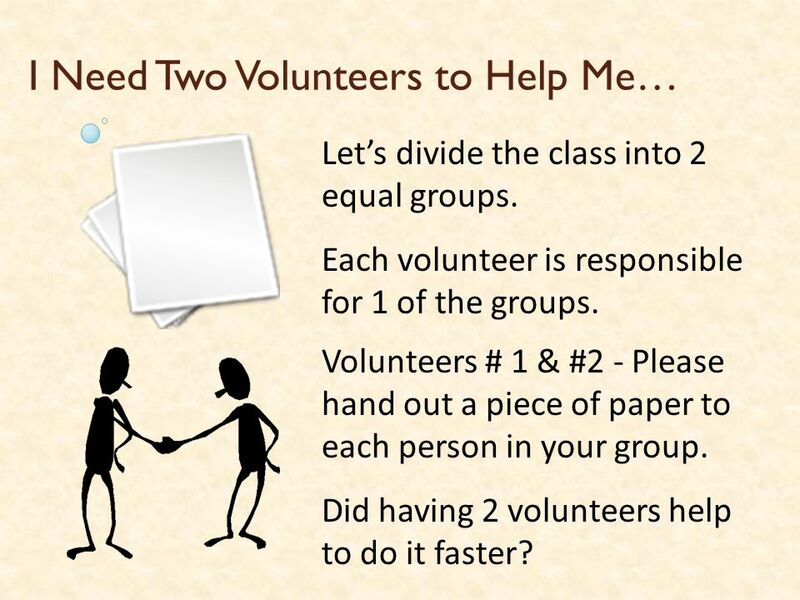 Volunteers # 1 & #2 - Please hand out a piece of paper to each person in your group. Did having 2 volunteers help to do it faster? 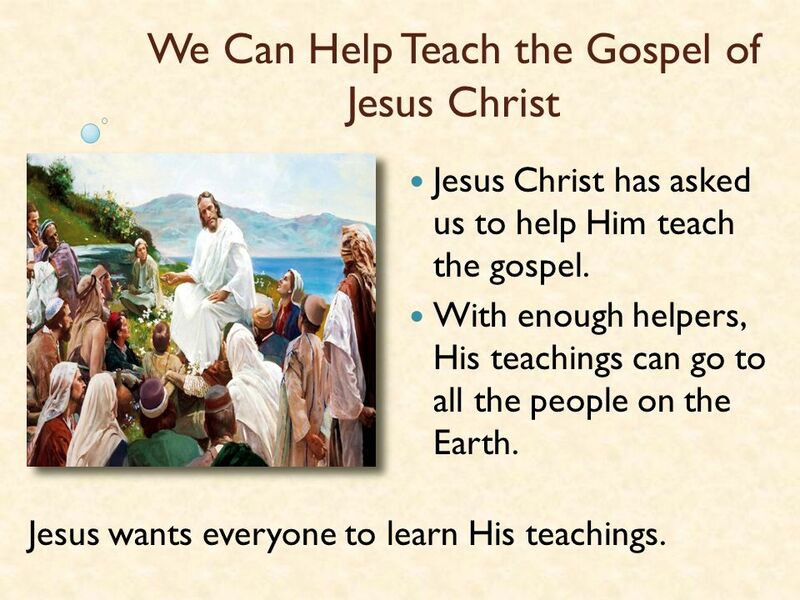 Jesus Christ has asked us to help Him teach the gospel. With enough helpers, His teachings can go to all the people on the Earth. Jesus wants everyone to learn His teachings. 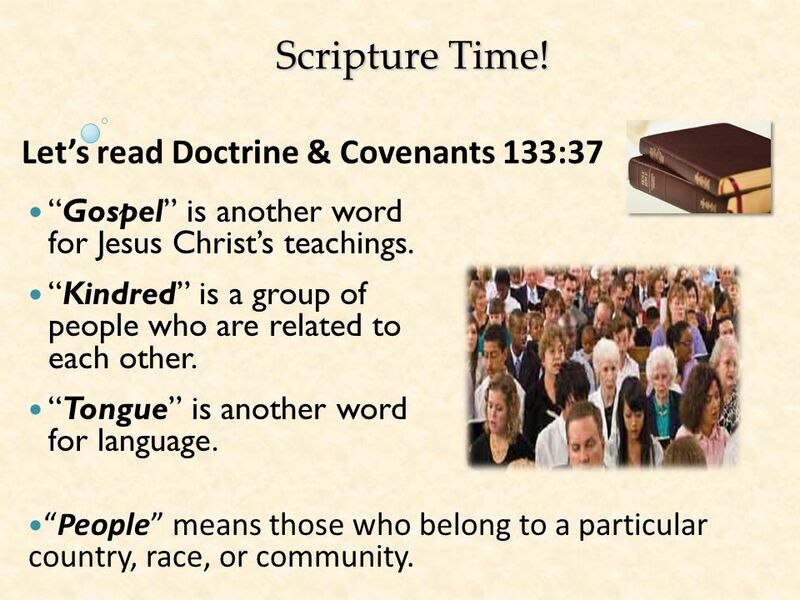 “Gospel” is another word for Jesus Christ’s teachings. “Kindred” is a group of people who are related to each other. “Tongue” is another word for language. “People” means those who belong to a particular country, race, or community. 7 Scripture Time! What does this scripture say will happen? 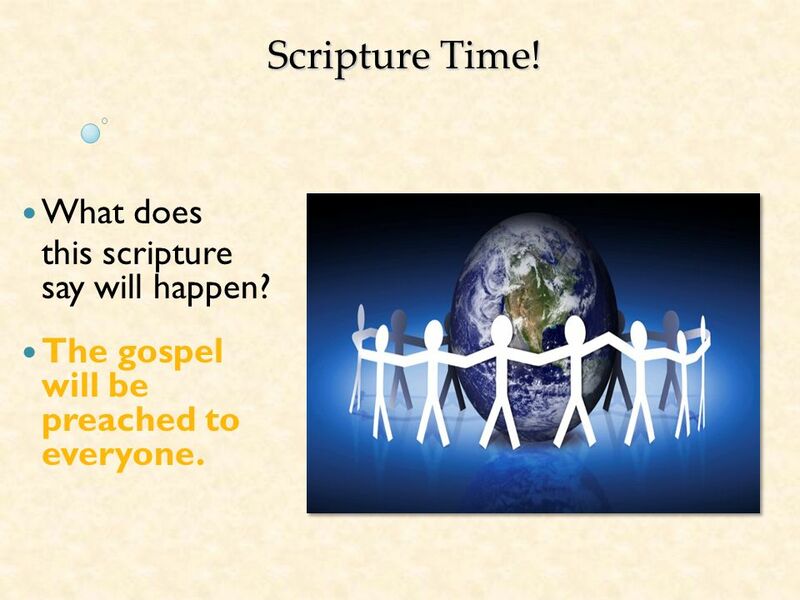 The gospel will be preached to everyone. 8 Scripture Time! 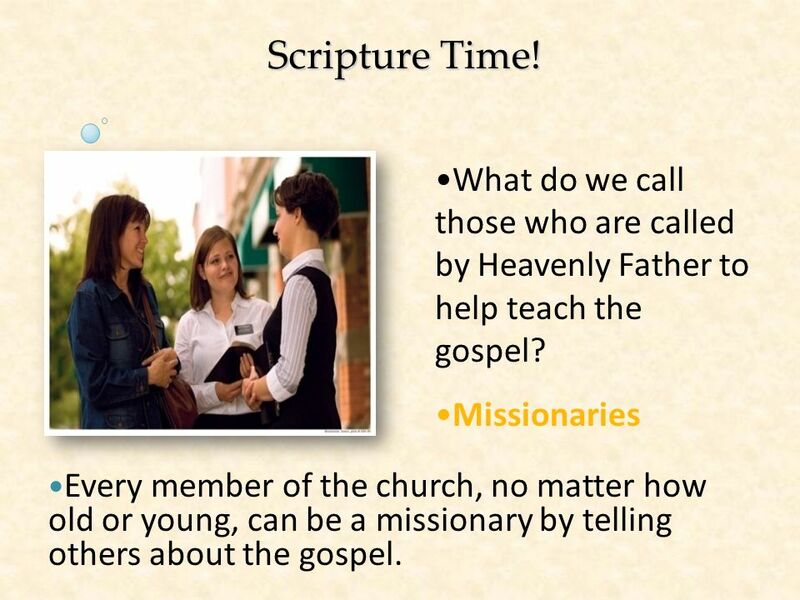 What do we call those who are called by Heavenly Father to help teach the gospel? 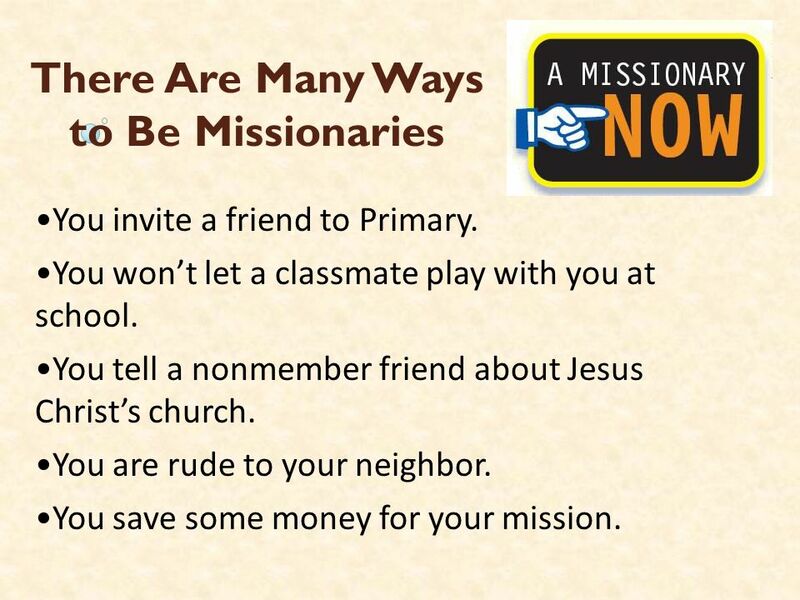 Missionaries Every member of the church, no matter how old or young, can be a missionary by telling others about the gospel. 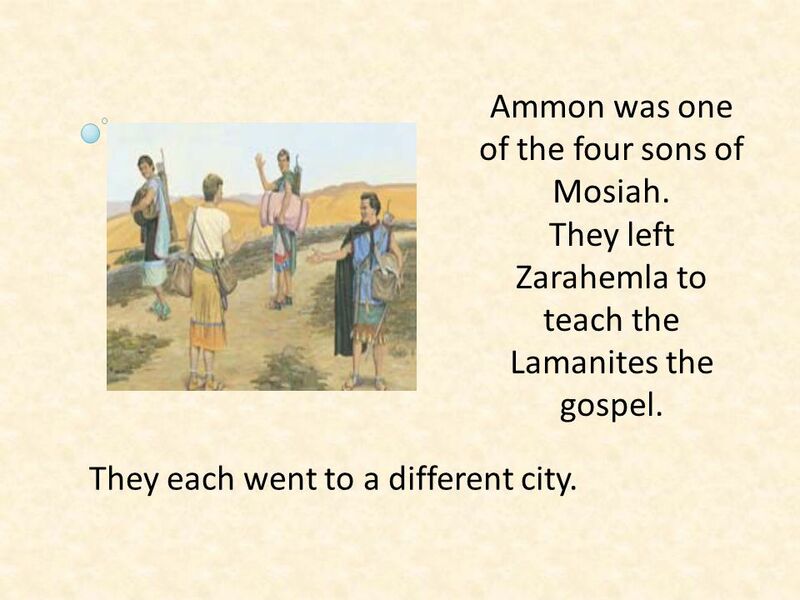 10 Ammon was one of the four sons of Mosiah. They left Zarahemla to teach the Lamanites the gospel. They each went to a different city. 11 Ammon went to the land of Ishmael. As he entered the city, the Lamanites tied him up and took him to their king, Lamoni. 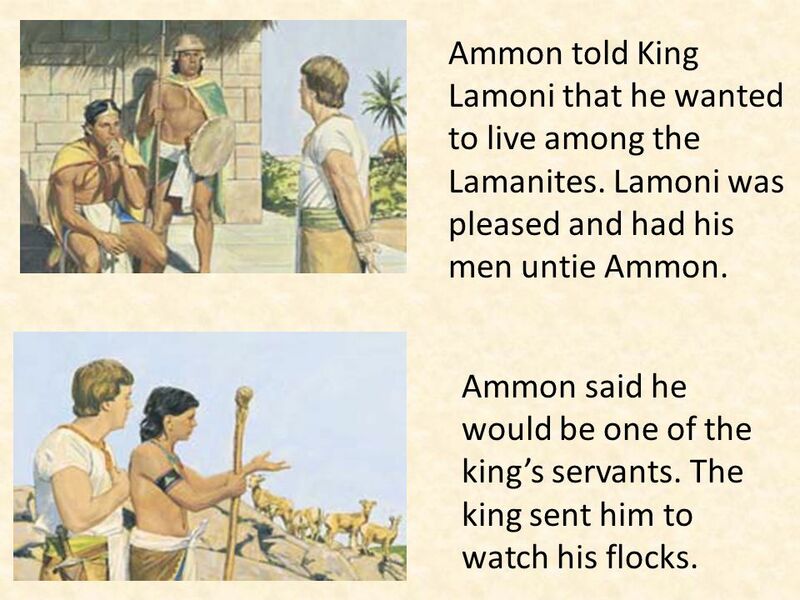 Ammon told King Lamoni that he wanted to live among the Lamanites. 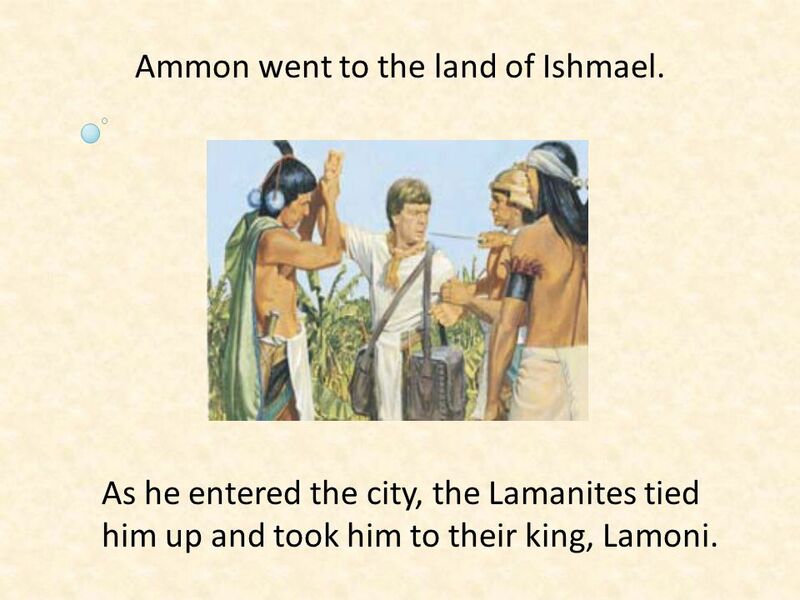 Lamoni was pleased and had his men untie Ammon. Ammon said he would be one of the king’s servants. The king sent him to watch his flocks. 13 One day while Ammon & some servants were tending the flocks, Lamanite robbers scattered the animals & tried to steal them. The servants who were with Ammon were scared. 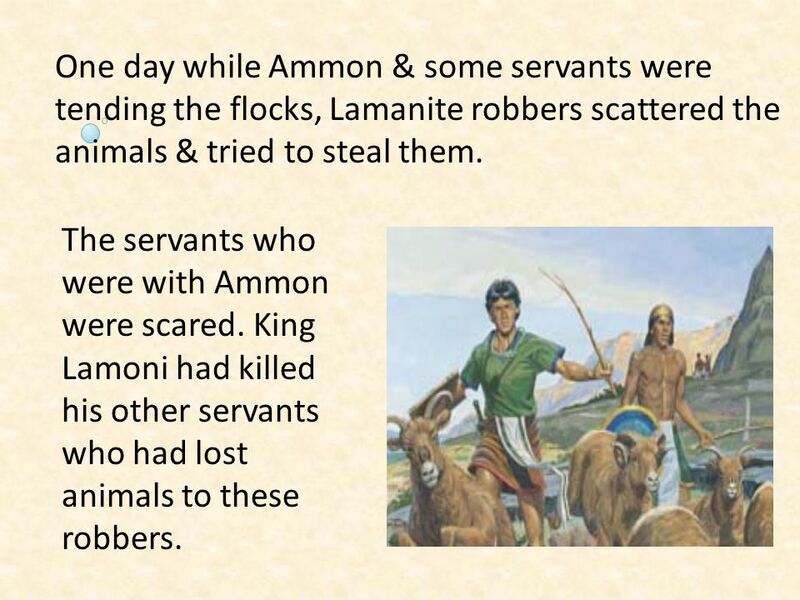 King Lamoni had killed his other servants who had lost animals to these robbers. 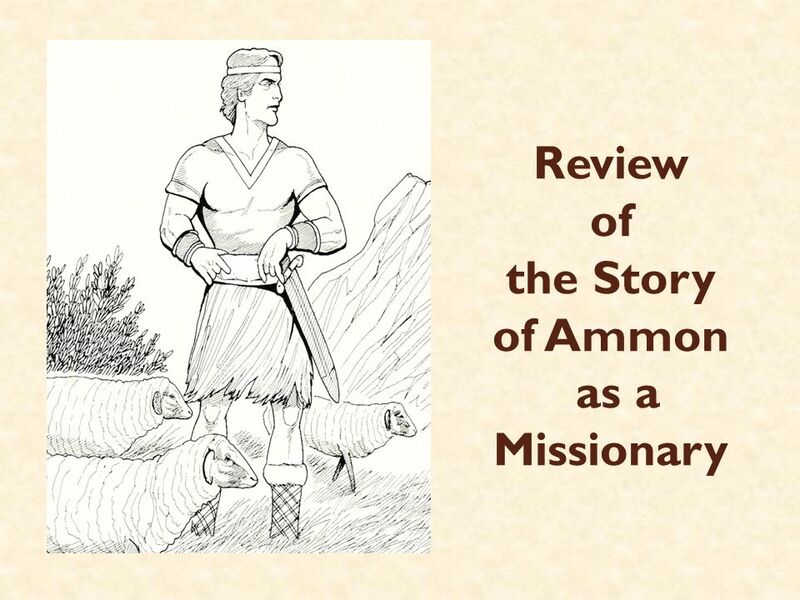 14 Ammon knew this was his chance to use the Lord’s power to win the hearts of the Lamanites. Then they would listen to his teachings. Ammon told the servants that if they gathered the animals, the king would not kill them. 15 Ammon and the other servants quickly found the animals and drove them back to the watering place. The Lamanite robbers came back. Ammon told the other servants to guard the flocks while he fought the robbers. 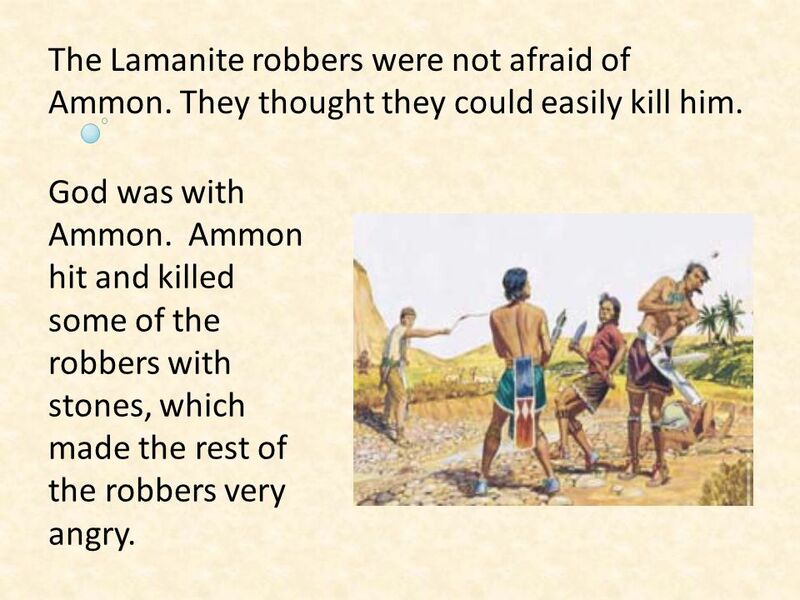 The Lamanite robbers were not afraid of Ammon. They thought they could easily kill him. God was with Ammon. 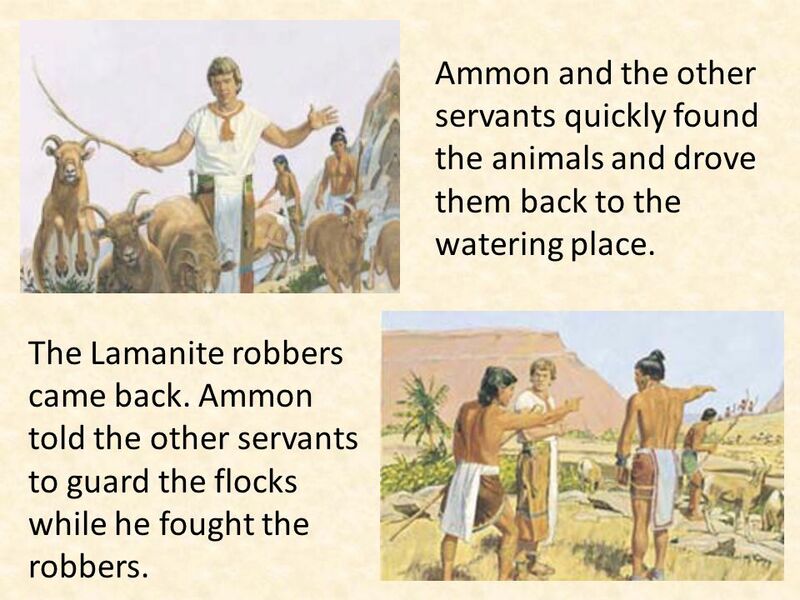 Ammon hit and killed some of the robbers with stones, which made the rest of the robbers very angry. 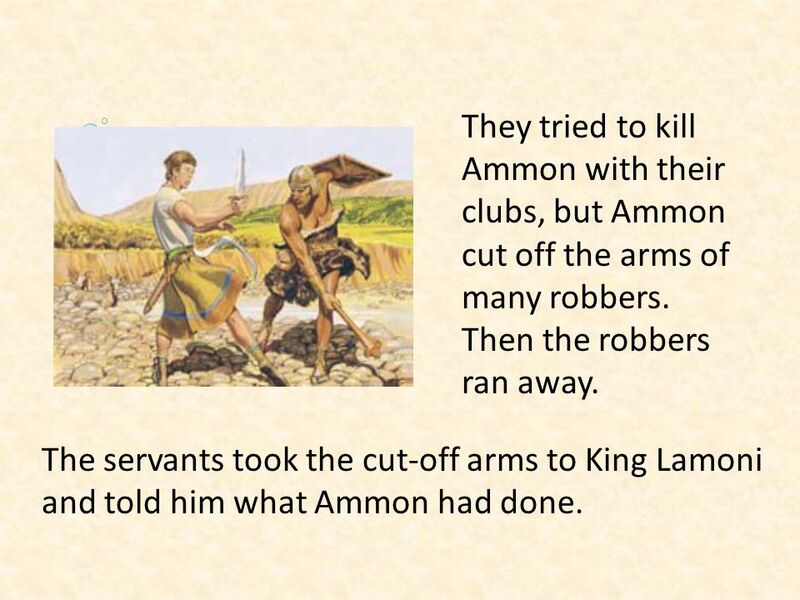 17 They tried to kill Ammon with their clubs, but Ammon cut off the arms of many robbers. Then the robbers ran away. The servants took the cut-off arms to King Lamoni and told him what Ammon had done. 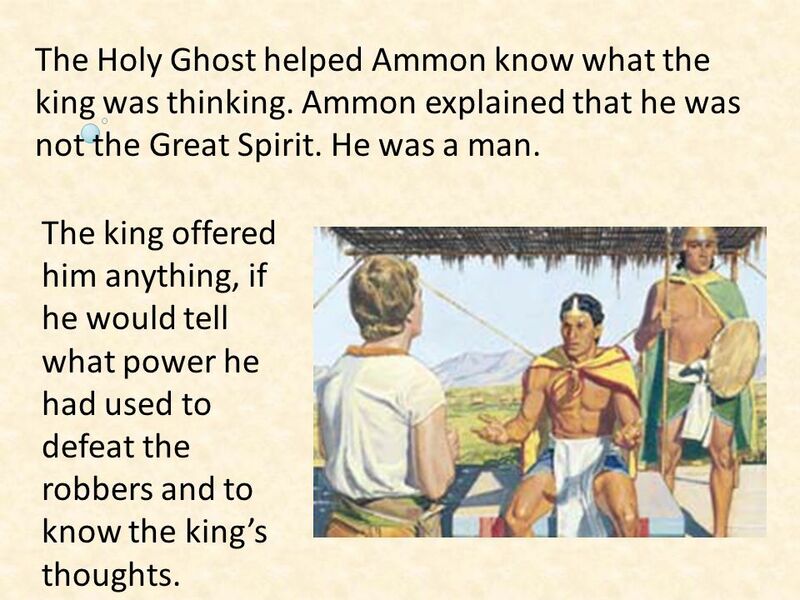 The Holy Ghost helped Ammon know what the king was thinking. 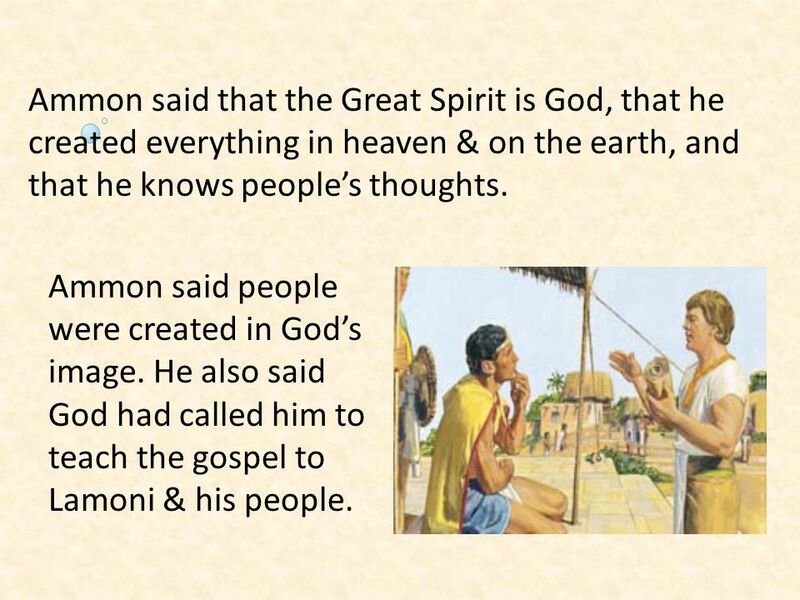 Ammon explained that he was not the Great Spirit. He was a man. The king offered him anything, if he would tell what power he had used to defeat the robbers and to know the king’s thoughts. 19 Ammon said the only thing he wanted was for King Lamoni to believe what he would say. 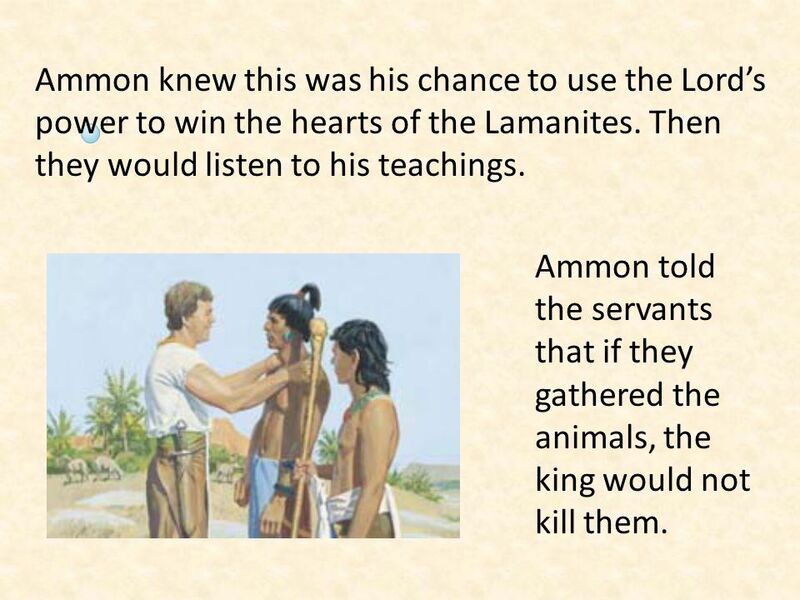 The king said he would believe everything Ammon told him. 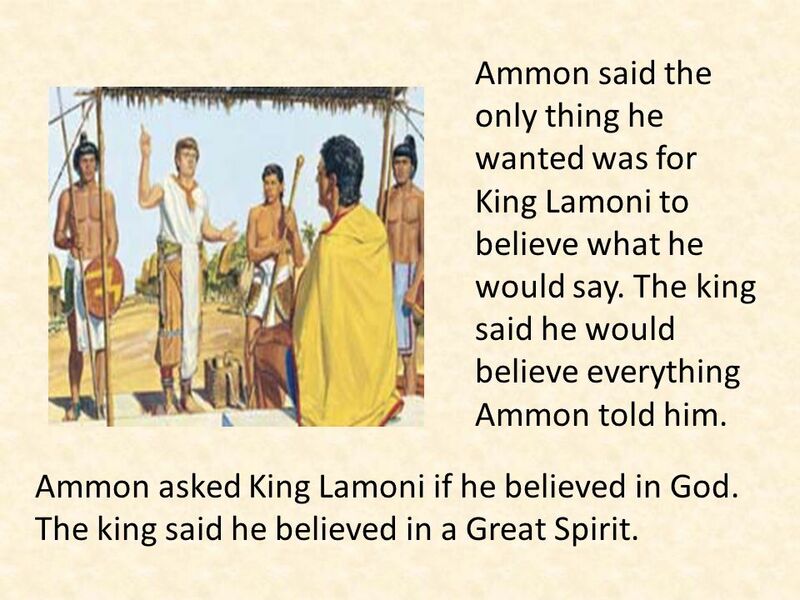 Ammon asked King Lamoni if he believed in God. The king said he believed in a Great Spirit. 20 Ammon said that the Great Spirit is God, that he created everything in heaven & on the earth, and that he knows people’s thoughts. Ammon said people were created in God’s image. He also said God had called him to teach the gospel to Lamoni & his people. 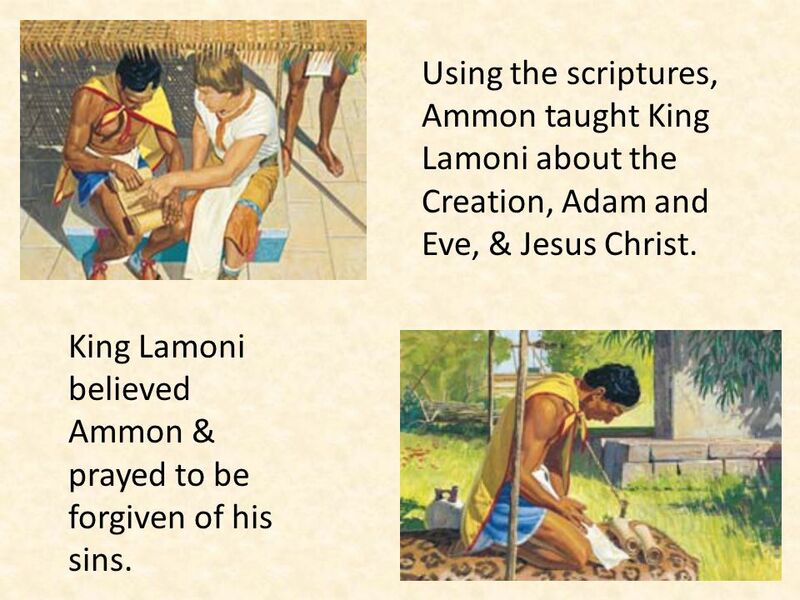 21 Using the scriptures, Ammon taught King Lamoni about the Creation, Adam and Eve, & Jesus Christ. King Lamoni believed Ammon & prayed to be forgiven of his sins. Then he fell to the ground & appeared to be dead. 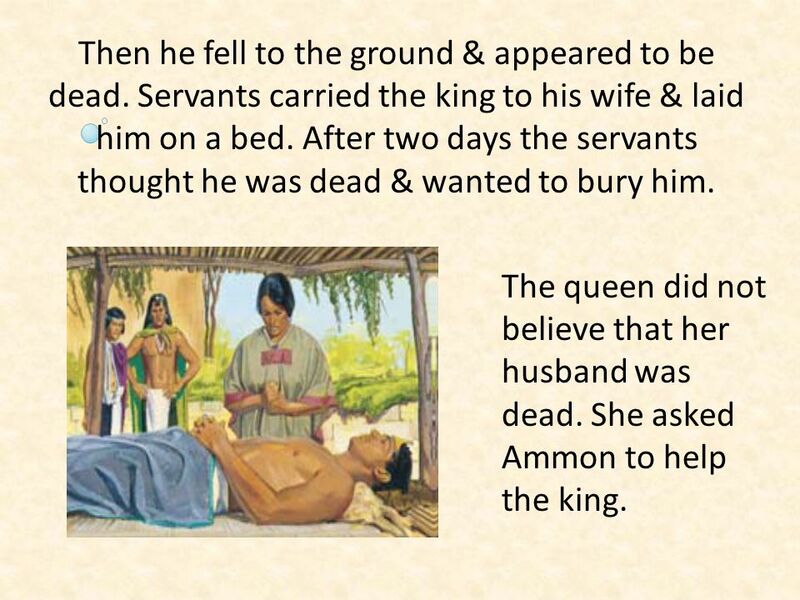 Servants carried the king to his wife & laid him on a bed. After two days the servants thought he was dead & wanted to bury him. The queen did not believe that her husband was dead. She asked Ammon to help the king. 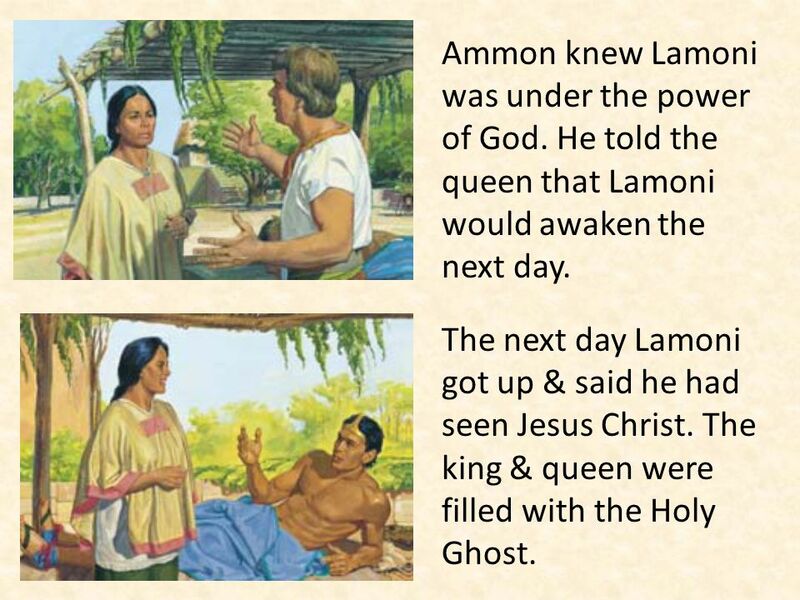 Ammon knew Lamoni was under the power of God. He told the queen that Lamoni would awaken the next day. The next day Lamoni got up & said he had seen Jesus Christ. The king & queen were filled with the Holy Ghost. 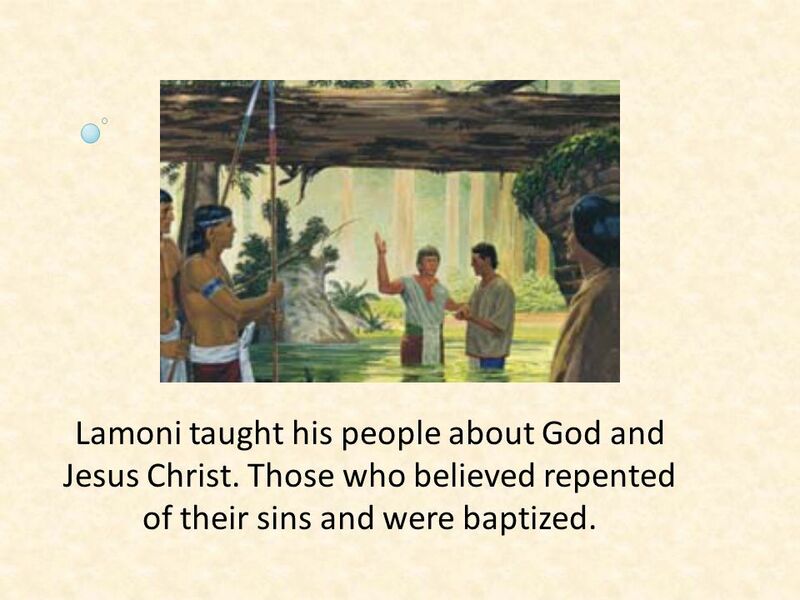 Lamoni taught his people about God and Jesus Christ. Those who believed repented of their sins and were baptized. Story Summary !! 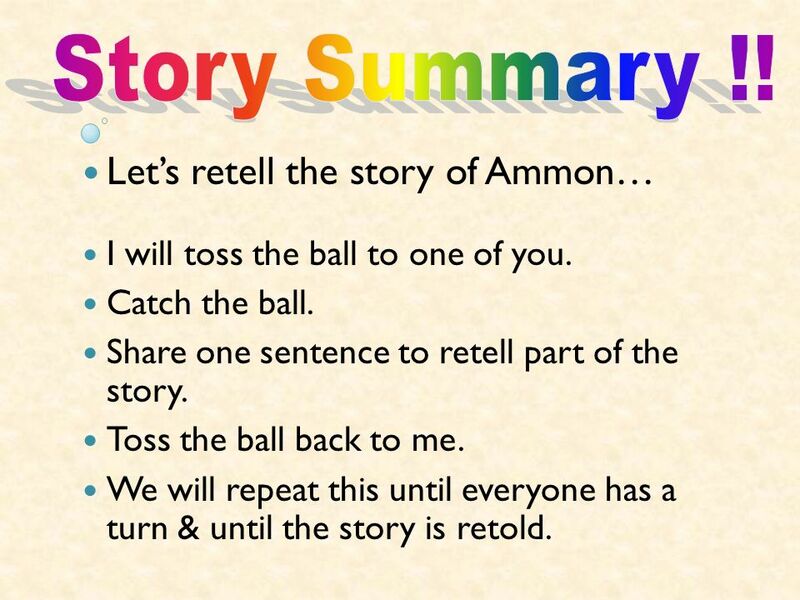 Let’s retell the story of Ammon… I will toss the ball to one of you. Catch the ball. Share one sentence to retell part of the story. Toss the ball back to me. We will repeat this until everyone has a turn & until the story is retold. You invite a friend to Primary. You won’t let a classmate play with you at school. You tell a nonmember friend about Jesus Christ’s church. You are rude to your neighbor. You save some money for your mission. Your friend asks you to cheat on a test in school, and you decide to do it. You invite a friend to your home for family home evening. You don’t obey your parents and brag about it to your friends. You invite someone new to play with you. 30 Testimony Time I testify that Jesus Christ has asked us to help him teach the gospel. With enough helpers, His teachings can go to all the people on the Earth. 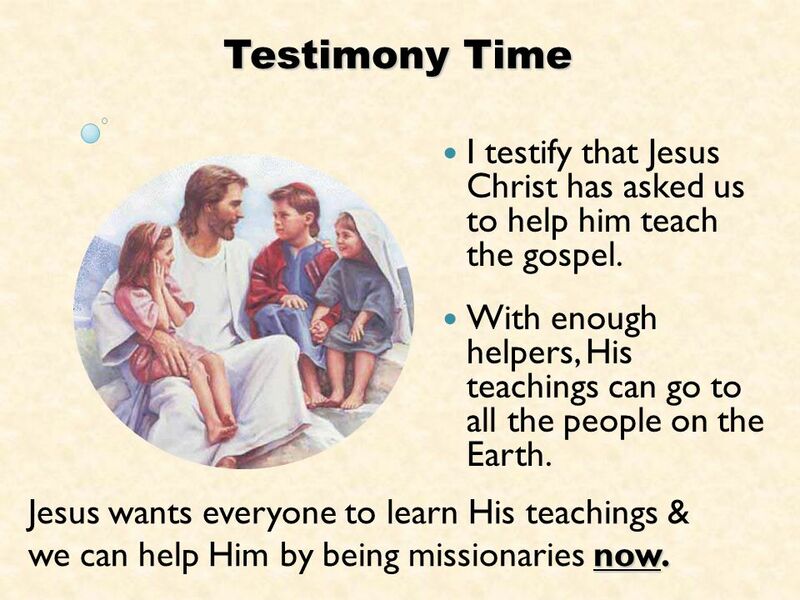 Jesus wants everyone to learn His teachings & we can help Him by being missionaries now. 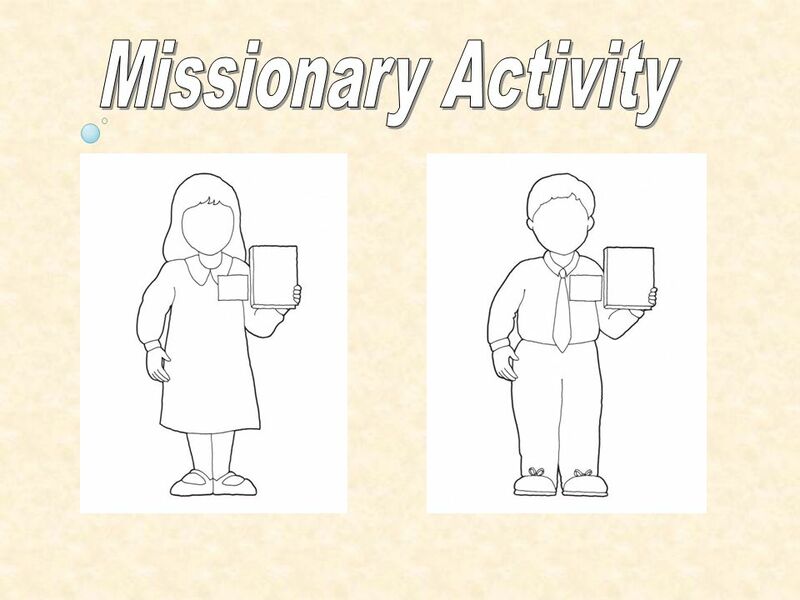 Images and clipart are from lds.org, sugardoodle.net, Microsoft Office, and other websites indicating the images were in the public domain. 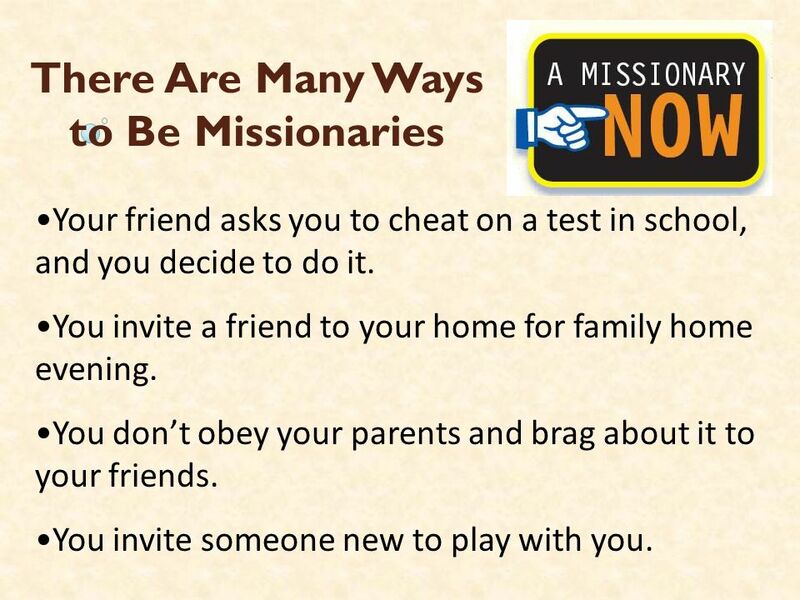 The lesson material is from lds.org. 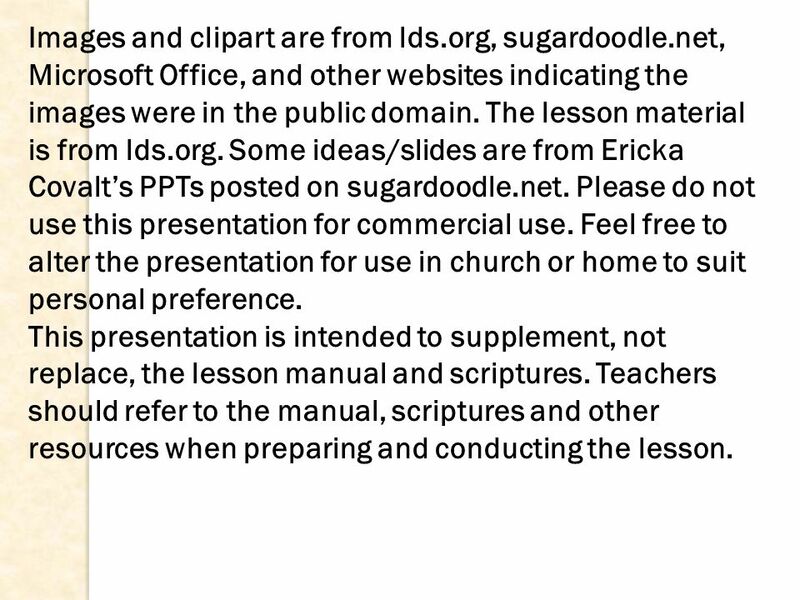 Some ideas/slides are from Ericka Covalt’s PPTs posted on sugardoodle.net. Please do not use this presentation for commercial use. Feel free to alter the presentation for use in church or home to suit personal preference. 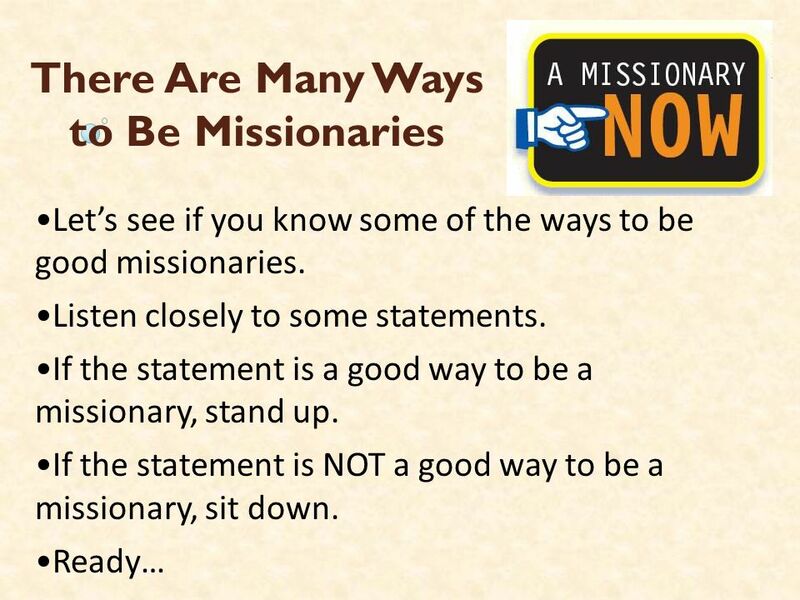 This presentation is intended to supplement, not replace, the lesson manual and scriptures. Teachers should refer to the manual, scriptures and other resources when preparing and conducting the lesson. 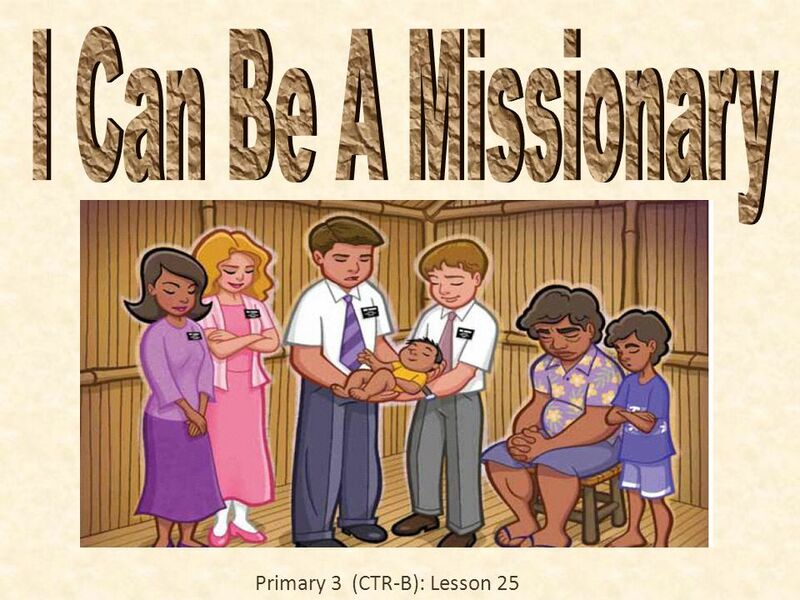 Download ppt "I Can Be A Missionary Primary 3 (CTR-B): Lesson 25." There are special messages hidden around the room. Keep The Commandments 1. Keep the commandments; keep the commandments! In this there is safety; in this there is peace. He will send blessings; He will. 1. I lived in heaven a long time ago, it is true; Lived there and loved there with people I know. So did you. Then Heav’nly Father presented a beautiful.